Although Jamie's 30 Minute Meals left me a little frazzled when trying to keep to the clock, it has turned out to be a really good book. Admittedly I don't really use it to create the full 30 minute meals but pick and choose bits from it. The fail-safe recipes have turned out to be excellent mid-week saviours and perfect for last minute dinner guests. Roll on a year and a half, and with a baby now in tow, time has become ever the more critical. There could be no more relevant book to land on my doorstep than Jamie's 15 Minute Meals because that's pretty much all I have to knock up a meal these days. For this latest book, courses or meals have generally been trimmed to two dishes maximum but this suits our mid-week eating better, we are not really a pudding household unless you count eating Nutella out of the jar! Flicking through, I could easily eat most of the food here. I like the relaxed yet often indulgent recipes and most would be a welcome break from the usual pasta and sauce, minestrone and risottos which form the bulk of our standard dinners. 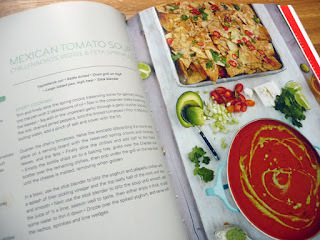 Photography-wise, this book is very on-brand with the Jamie empire; spalttered platters and creative mess which makes the food look all the more deliciously relaxed. 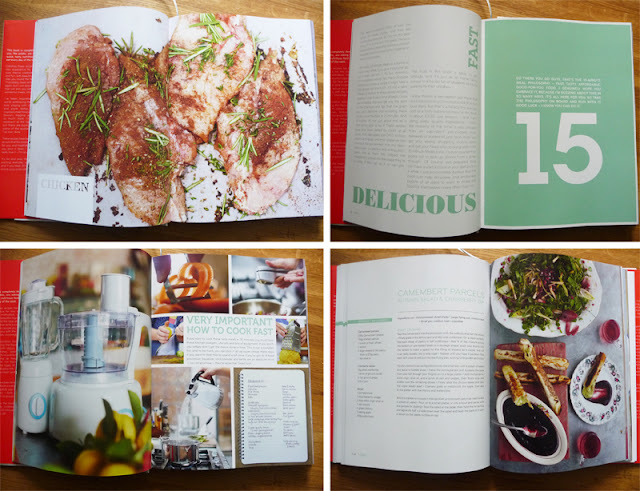 The book itself seems to be less "designed" than past titles and relies heavily on the good food photography for interest. It's passable, but not as beautiful or well crafted and the typography (which really gives the last few of Jamie's books an edge design-wise) is bland and awkward in the introduction sections of this book, although clear and simple for the recipe layouts. For this book there is also preparation notes at the beginning of each recipe which is outside of the 15 minutes so don't expect to walk in the kichen and back out in the time with a finished dish. I notice that nutritional information has made an appearance with calorie advice and a further section on nutrition at the back. Anyway, enough of the chatter. 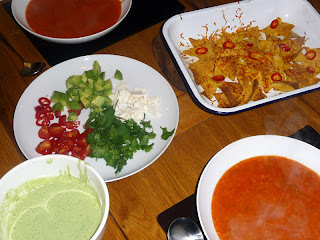 This wouldn't be a Graphic Foodie book review without a few test recipes. Start the clock! This was a cracking meal for 15 minutes, a real mid-week luxury. Packed with flavour and interesting to eat from beginning to end. 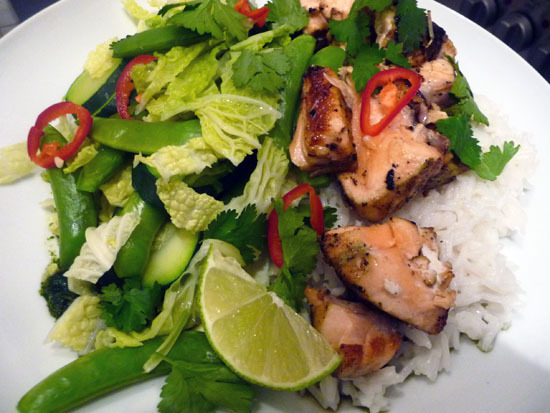 I particularly liked the green tea element with the coconut rice and zingy coriander dressing for the vegetables. Big thumbs up. Cooking-wise, it was simple and very do-able in the time scale. The kitchen did look a total wreck after as you need to use a few pans but I would say it was still worth it. As seen in the picture, 15 minutes leaves precious little time to do anything other than slap it on plate which is fine with me, I sure wasn't going to add to the washing pile by using serving platters as suggested. If, however, you spent a little more time on the presentation, this would be an effortless meal to pull out of the bag for a dinner party. I was a bit dubious about the soup as I find when using tinned tomatoes with short recipe cook times, that there isn't much depth in the taste. This wasn't the case here and this was a really flavoursome, filling soup. 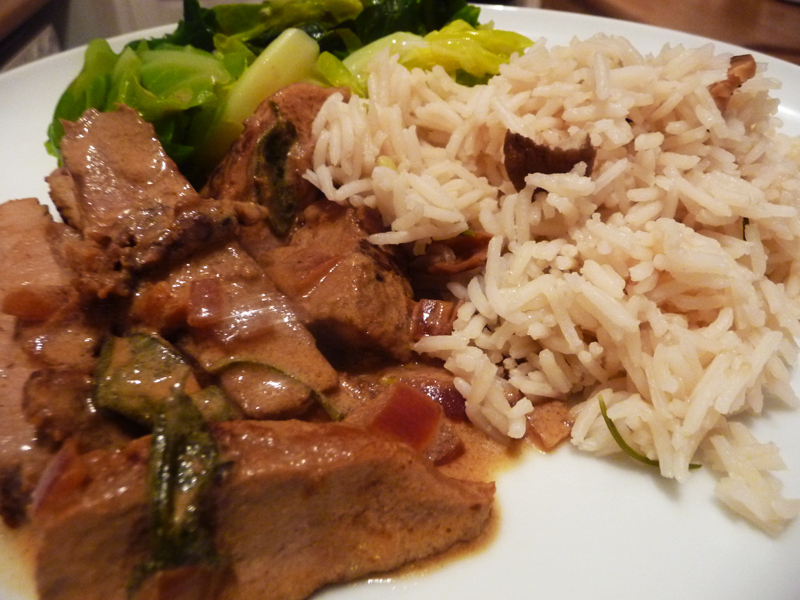 The addition of rice bulked it up and the jarred roasted peppers gave dimension. 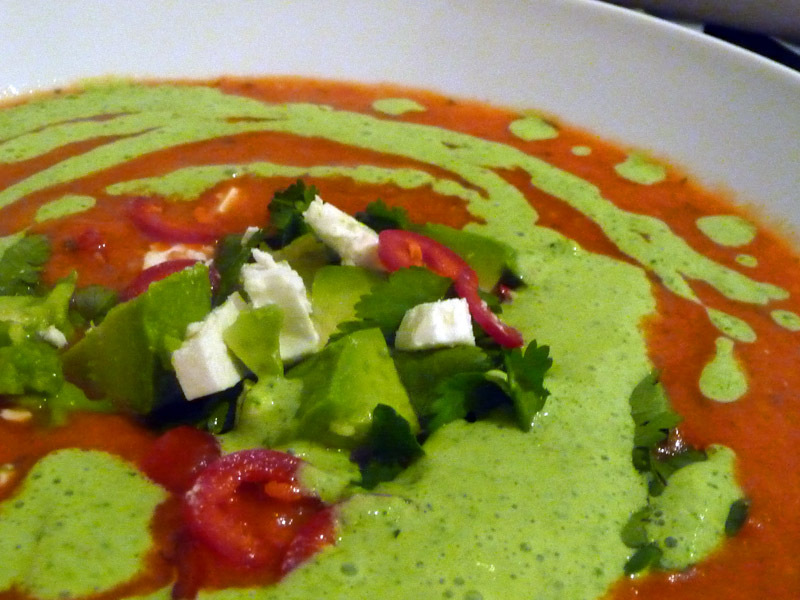 The fresh avocado, tomato, coriander, chilli and feta "sprinkles" were great and something I never do when serving soup but made it interesting texturally and in taste. The cheesy, chilli nachos suffered the casualty of cooking with haste and I burnt the first batch but had another ready in no time. Along with the minty yogurt drizzle, this was a really pretty little dish. Another pretty impressive meal to get out so quickly. Pork, Marsala and cream is a classic and I liked the vamped up rice. The Porcini really infused the rice which was an ideal accompaniment to the meat. Could have done with more sauce so will double up next time I make it. By request after Mr GF saw these on the telly series which accompanies the book. 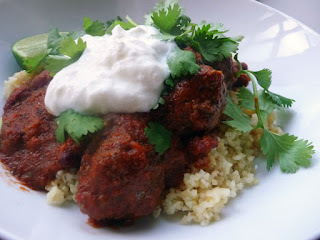 A little more laid back than some of the other meals, but again good flavours and something a bit more unusual. Really liked the lemon and cinnamon bulgar wheat. A lot of the issues which arose from 30 Minute Meals seem to have been addressed here such as the expensive and lengthy ingredient list and high calorie/fat content of the recipes as well as the slightly unrealistic cooking times for the bog standard home cook. The recipes and style of food this time is so much more sensible for everyday. So you can see I'm pretty pleased with this book. I like the style and I like results. I know this will not be collecting dust on my shelf and will be happily food spattered and well used. As with 30 Minute Meals, I won't expect to cook everything in 15 minutes, and I'm not investing in any more "time-saving" kitchen equipment the book strongly recommends. I'm happy with my knives and a few extra minutes here and there (and even happier that I won't have the extra washing up). This book has a really wide range of recipes from meats, fish, pasta and soups to sandwiches, breakfasts and even smoothies. Jamie will again be up for some criticism as people (mainly journalists) will argue how feasible the meals are to create in the time specified, but I think this book is realistic and unless you are a total putz in the kitchen, you will be able to get these down in the time or at least in 30 minutes without the gear and at a more casual pace. Yup, so highly recommended to add a little va va voom to mid-week meals. You can also catch the accompanying series on Channel 4 where Jamie uses the word "narley" a lot. 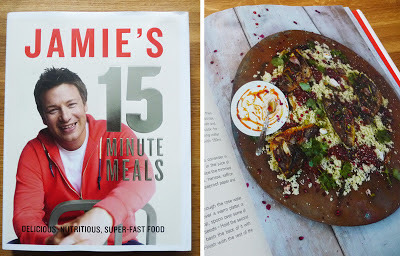 Jamie's 15 Minute Meals by Jamie Oliver is published by Michael Joseph and costs £26.00. I received this (again, signed-woo!) copy for review.